Once a mere cultural resource (2000-2004), this site was, little by little, led to offer a tribune to those brave scientists who dare expose the growing pseudo-science (“1 hookah=200 cigarettes” “sweep-it-under-the-carpet” so-called ““waterpipe””™ “science”) and whose now open objective is PROHIBITION. We consider prohibition of smoking as antithetic to the spirit of world major religions (Taoism, Islam, Buddhism, Hinduism, Communism, Judaism, Christianity, etc. ), particularly the 2nd and 5th ones. Against this new pseudo-scientific obscurantism, we invite you to RESIST in the field: on campuses, hookah lounges, etc. WE HAVE WON THE BATTLE in France where hookah lounges stayed open thanks to our friend’s debunking of the great fraud about hookah “passive smoking” [2009 STUDY](which was already a fraud in relation with cigarette smoking...). We are also firmly committed to fight those who shamelessly promote, in the absence of any evidence and sound study, the pharmacological treatment of supposedly “hookah addicts” (read here). NOTE 2009: We apologize for the hectic update and the whole mess…humm… We have been fighting hard, you know, and alone against giants [WHO fake reports, National Bans, Neo-McCarthyst Witch-Hunts, Defamation Campaigns, Censorship, Millions of Dollars for Pseudo-scientific and Media Violence, etc, etc... not to mention the Indifference and Unawareness of targeted populations]. We sincerely hope that The Sacred Narghile will be restored soon to its original purpose. >>> READ CRITIQUES OF THE 2 WORLD HEALTH ORGANIZATION ERRONEOUS REPORTS ON "WATERPIPE TOBACCO SMOKING"
World and Ever Historic Premiere: Study (May 2008, Online Free) on HOOKAH (Shisha) and CANCER Markers: You’re Dead! A constantly updated online ressource for those who want to know. For example (Jan. 19, 2008): The “Nicotine and Tobacco Research” Journal Endorses a Scientific Error as Big and Carcinogenic as a Yemeni Narghile Bowl ! 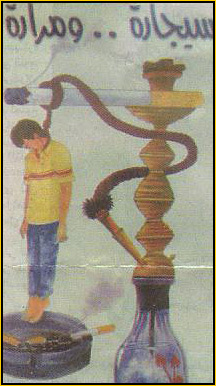 Hookah (Shisha, Narghile) Smoking and Environmental Tobacco Smoke (ETS). A Critical Review of the Relevant Literature and the Public Health Consequences. International Journal of Environmental Research and Public Health. 2009; 6(2):798-843. For centuries now, dozerns of millions of people have been using the narghile (hookah, shisha, "water pipe", "waterpipe"™, "hubble-bubble") in a "recreational" way, that is once or twice a week, once a month or on occasions. However, by no means, this method can be an alternative to cigarette smoking. If you are a dependent cigarette user thinking of quitting this way, then you may be wrong. Stop deluding yourself right now ! The only thing you may succeed in is to become a hookah chain smoker. Are you ready for this ? So, we invite you to take psycho-medical advice or, better, efficient non-medical advice with tose nice people who say "A Desire Cannot Be Addressed with a Ban" . For more information, please refer to the relevant section of this site or get in touch with us through the “Contact Us” page. Further to the revival of its use in the Middle East in the 80s and 90s, narghile (hookah, shisha, waterpipe, hubble-bubble) has now become a globalised habit in the wake of which new studies appeared. The most interesting results stem from 2 important studies carried on in the early Sixties, several others by Salem in Egypt and, more recently, the valuable work done by teams in Jordan , India and Pakistan. However, in many cases, the corresponding results cannot be relevantly used because very often one cannot clarify if the committed volunteers were exclusive narghile smokers, ex-consumers of cigarettes having one day stopped smoking or yet having substituted for it the practice of narghile. Indeed, as pointed out by several researchers in Turkey, narghile smokers, particularly those who are dependent, belong to this last category. In the opinion of an independent renown researcher in this field, it is now necessary to study the effects of narghile on exclusive smokers, not having indulged during their past career neither in the use of cigarettes nor in any other form of tobacco (cigar, pipe, bidi, etc.). Because of the tobaccological peculiarity of its mechanisms (nicotine, cotinine, flavours, important interaction with the socio-cultural context) and thanks to the diverse points of view it offers to the researcher, narghile undoubtedly can help improve our understanding of cigarette dependence. A Critical Review Of Scientific Literature on Narghile (Shisha, Hookah, Waterpipe) from its Origins to Date: the Need for a Comprehensive Socio-Anthropological, Medical and Pharmacological Approach. Tabaccologia 2005; 1: 39-47. Narghile: aspetti chimici e farmacofisiologici. Tabaccologia 2005; 3: 27-33. [Engl.Biochemical and Pharmacological Aspects of Narghile]. Patologie associate all'uso del narghile. Tabaccologia 2006;1:27-34. [Eng. Narghile-Related Diseases]. Shisha, hookah. Le narguilé au XXIème siècle. Bref état des connaissances scientifiques [Eng. 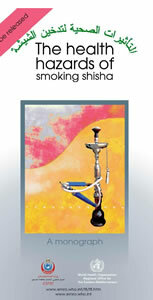 : Narghile, Hookah in the 21st Century: An Overview of the Scientific Knowledge]. Le Courrier des Addictions 2004 (Oct); 6 (4): 150-2. Tabacologie du narguilé. Alcoologie 1999 : 21 (1/83) : pp. 88-9. Hookah does not filter all nicotine and tar but we can say that a one hour session provides more or less a nicotine level equivalent to that found in one cigarette. As for tar, it depends on the size of the device, the nature of water, the frequency of inhalation and other factors. However, don't expect to get more than half of the initial tar filtered out. However, hookah tar is probably less dangerous than cigarette tar because the temperatures are completely ifferent: c. 100°C in the first case and c. 900°C in the latter. The more elevated the temperature is the more dangerous and carcinogenic tar is. It's hard to decide. On the one hand, really dependent hookah smokers (mostly to be found in Asia and Africa) seem not to become, one day or another, cigarette smokers. On the other hand, the same dependent hookah users (either of unflavoured or flavoured tobacco) would not, in a situation where they cannot access a pipe, switch to cigarette smoking that could, we can assume that, provide them with nicotine. Amazingly, tumbak (raw moist unflavoured tobacco) smokers, in a situation where a hookah is not available, would not accept, even temporarily, to smoke tobamel (flavoured tobacco) and vice-versa. So, the question of nicotine is not decided at all. Dependence, when it happens (rare in the case of recreational use), would be a complex structure not necessarily centred on nicotine but, rather, on cotinine and flavours not to forget the social and cultural setting of the “situation” which might play a not so minor role. First off, try to smoke only once a week then only on social occasions (birthdays, Christmas, wedding parties, picnics, etc.) just like those peoples you love in Asia and Africa have been doing for centuries. smoking outdoors, for instance in a green patio or garden surrounded by plants. using a bigger hookah. Effectively, the bigger the pipe, the lesser it produces CO.
using natural charcoal instead of commercial (self-lighting and the lot) charcoal. Another problem with the latter, besides its nasty smell during the few minutes following its lighting up, is that its composition is unknown. This handy commodity might however contain dangerous elements. from time to time, blowing (instead of drawing air) inside the hose to get rid of the smoke CO building up over the water urn. not cramming too much the tobacco mixture inside the bowl. Try not inhale deeply. Retain smoke in your mouth imitating toads before they gulp down insects. It must be clear to cigarette smokers that a single one-hour hookah session provides in the worst case with the nicotine equivalent of only one cigarette so they should understand that hookah cannot be an alternative to their cigarette smoking habit. This would be an illusion and another problem would be that these users would naturally tend to inhale deeper and deeper in order to "compensate". Share the hose because it is a four-century old tradition in Asia and Africa. By doing this, you will inhale less smoke and keep to the habit its essential playful, collective, convivial and recreational dimensions and, by the same token, you will move to a distance, further off and banish the dependency spectre which also exists albeit it's completely different from that induced by cigarette smoking. Spacing inhalations reduces tar production. The longer the hose the better it is. The user should not become an extremist so he must learn to stop smoking before the end of the session. Otherwise, he would inhale impure combustion elements. Change the pH (“acidity”) of water to hold back as much as nicotine as possible. Find the ad hoc chemical substances to be added to water to stop as many harmful elements (tar, etc.) as possible. Note: water already stops many of them (among them some known carcinogens). Let's only consider here acrolein and acetaldehyde the filtration of which makes hookah smoke accepted even by… non-smokers. In the light of the facts set out in the above pages, one must bear in mind that the most important condition is to work with exclusive narghile smokers, from both sexes. Some (not to say most) of them are “recreational” – but are they really of interest for tobacco control specialists ? - and others are really dependent. Anthropological approach is here useful because sometimes, one can hear of banning its massive use. Before applying any kind of blind prohibition - which could lead to many negative consequences, tobacco control workers should not forget to take into account the socio-cultural background of narghile use, as an independent researcher in France did in his doctoral thesis a full chapter of which is dedicated to health and pharmacological aspects. Our opinion is that a priority should not be to ban it simply because it is not a “nice” scene, for foreigners and tourists, to see entire terraces crowded by smoking grown-ups… By the way, many of the former enjoy indulging in it… In this respect, the case of Tunisia, where narghile smoking has been banned only in terraces, but not inside the same cafes will undoubtedly lead to a backlash effect: inside those ill-aerated places, smokers, and non-smokers alike, will be even more exposed to the dangerous carbon monoxide. This is why, in the light of public health concerns, we believe, from a harm reduction perspective, in the possibility of replacing the carbon monoxide producing coal by an other ignition device (electric resistance, etc.). That would not mean that we are “pushing” people but that we are concerned by the dangerous aspects of their habit. In another place, intelligent prevention can be carried on.